Compliments of Oswego School. Miss Erna Miebes, Springwater, Oregon, R.#1, Box 4. Description Sepia photo; creases & stains. Same as photos 90 & 1503b. 7/16/2000, note with photo: The postcard belonged to Erna Miebes who lived in Springwater, Oregon (now Beavercreek [Redland?]). date unknown, early 1900s. Donated by Kathi Scaihioyh [? 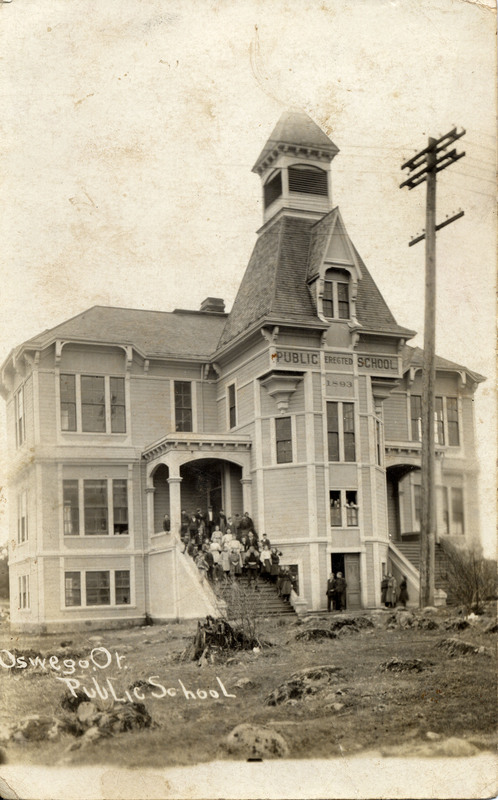 ], Hillsboro, Oregon, great niece of Erna Miebes. Erna died of the flu in her 20's. Transcription Compliments of Oswego School. Miss Erna Miebes, Springwater, Oregon, R.#1, Box 4.